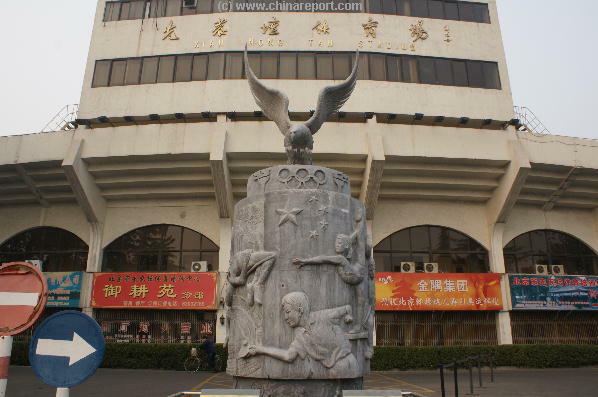 After Entering the Xian Nong Tan Park through the Main South gate one confronted with a small roundabout with in the middle a large Art Piece of and behind it some of the Main Offices attached to the Large Stadium. The meaning of the Art Piece is not immediately clear beyond that it obviously celebrates sports and the Olympic spirit. It features several Olympic Sports in which China is traditionally strong: among them, high jumping, ping pong and gymnastics. The large piece is a modern one which was installed fairly recently. Head inside the Main Building to ask for information, or simply to have a look inside the Giant Stadium. It is not of Olympic Size, but its still an impressive facility. View of the Modern Art Piece celebrating Sports and the Southern Front of The Altar of Agriculture Sports Stadium. To go to the Altar of Agriculture (Xiān Nóng Tán , 先农坛) and remnants head Left and West around the Stadium to find them on the North Side. 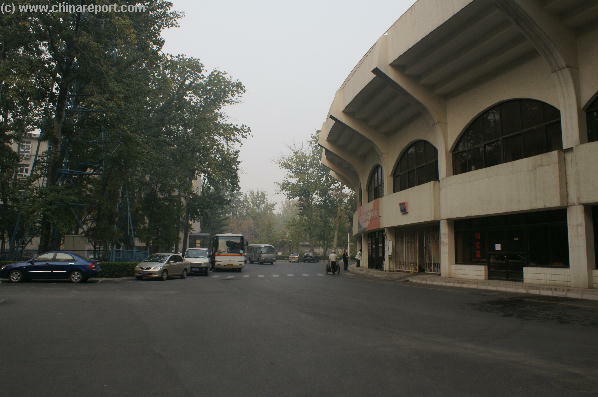 The Beijing Xiannongtan Stadium was originally a football (soccer) stadium. 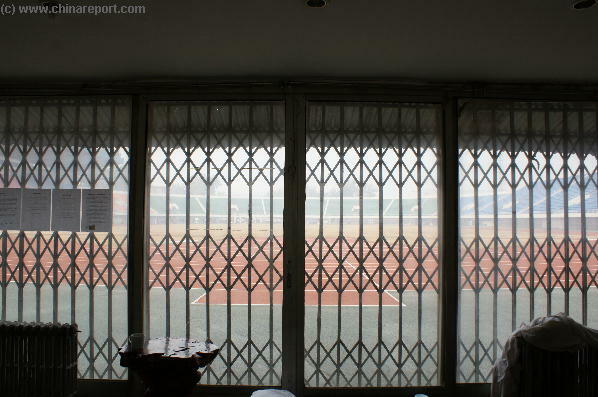 It was built in 1936 AD as the Beijing Public Stadium and since filled this spot inside the Altar of Agriculture Park. Not much much information is available on its history, however from November 1986 AD to September 1988 AD it was renovated improving the stadium among things with additional facilities and better lighting. Groundfloor view from the Offices at the Inside of the Stadium. At the right Time one can have a small guided Tour and a look around. Especially Sports Fans are welcome. Stadium itself has a seating capacity of 30,000 persons. The actual Altar of Agriculture of the Past, during Imperial Ceremonies, served in conjunction with the nearby Temple of Heaven. Underneath the West Flank of XianNongTan Stadium. Just North of the Stadium are some small displays and various relics reminding of the Temple of Agriculture. Hence, those looking for the Altar remnants must walk the Long way north around the Stadium before finding historic treasure. The first relics to be found do not look like very much at first, however they are officially know as the first (ever) museum in China focusing on ancient Chinese Agricultural and related. technologies. Taking this into account it makes for a fairly intrusting small display. This Map includes the Location of the 5 Altars of the Ming Dynasty. straight roads. One leading out of the West Heavenly gate of the Temple of Heaven Complex into the Temple of Agriculture Complex, and one more to the North connecting directly to actual Altar of Agriculture. surrounding wall which was squared in the South, but rounded in the North symbolizing the connection of Earth (She,Square) and Heaven (He, round). Passing through both Temples from North to South one symbolically passes from Earthly Life into Heavenly Realms. Hence the long walkways and boulevards which finally lead to the main Altars. Today the space that once held the Temple and its Pavilions are taken up by the Stadium and adjacent sporting fields and apartments for visiting sportsmen & women. 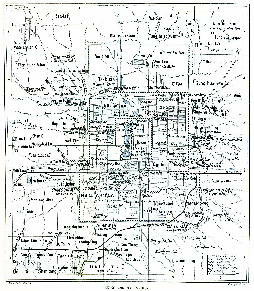 Map depicts major and minor roads, villages and Towns, Walled City of Beijing, Clearly visible there are two raods connecting Themple of Heaven and Temple of Agriculture into a combined complex. A stele explaining the History of The Temple and Altar of Agriculture in brief and commemorating the opening of the Museum. 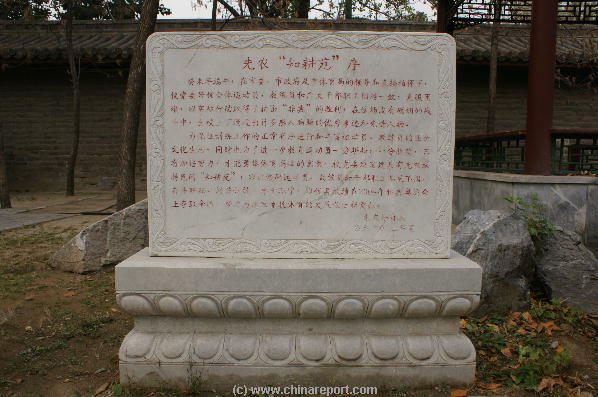 The Altar of Agriculture is the imperial altar dedicated to one of the mythical ancient first Emperors of China, the so-called Shen Nong who gave the ancient Chinese People Farming implements and knowledge of Crops. sufficient rain and abundant harvest in the Future, appease the Gods and prevent natural disasters. To be complete, according to the legends explaining the appearance of Chinese Civilization and what is now known as the first Dynasty, the Xia Dynasty, were laid by the "Three Emperors and Five Sovereigns". Among these is the well-known Yellow Emperor, a leader an scholar also said to be responsible for the earliest foundations of traditional Chinese medicine and who's Queen is said to have been the first to raise silk-worms and develop a primitive silk industry. The other important ancient Emperor and Immortal is Shen Nong, the bringer of Agricultural progress. Among things Shen Nong is supposed to have been responsible for creating the first primitive farming tools, such as the hoe and the wooden-plow. The Third Emperor, Wu Xi, supposedly dedicated himself to the domestication of all farm animals of the early civilization. However he is not revered at this site. 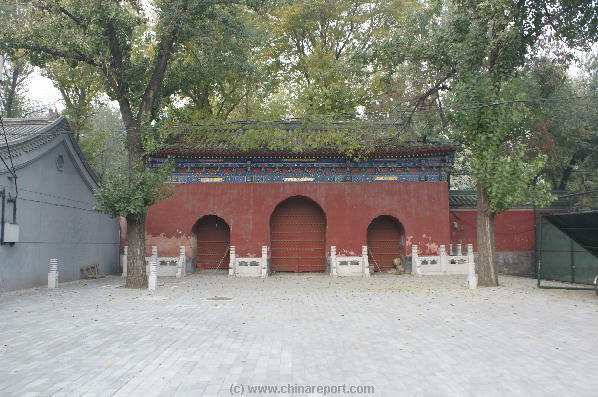 A historic Gate and remnant of the disappeared Temple Complex and Steles commemorating the Ancient Emperors who brought Agriculture and knowledge of silk worm farming and silk production and weaving. The Wife and Empress of the Yellow Emperor, Leizu (wife of the Yellow Emperor) has her very own Altar in the Xicheng District of Beijing.It is known as the Altar of the Goddess of Silk Worms and is located to the northeast of Zhonghai (Central lake) and can be reached by a bridge from the Temple of the Dragon King (Longwangmiao). 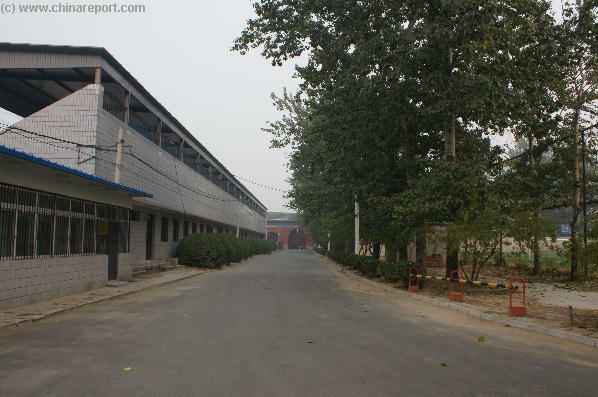 The Zhongnanhai complex today however is the highly secure compound of the Chinese National Leadership and is not opon to the General Public. 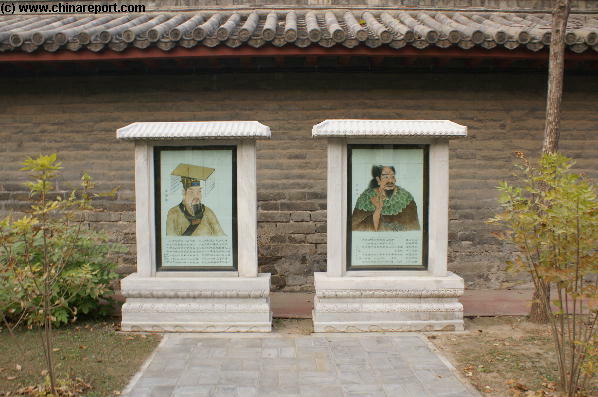 The portrait of the Yellow Emperor, inventor of Chinese Traditional Medicine and Shen Nong the inventor of agriculture and tools. Ancient mythical Emperors the Yellow Emperor, who's Wife is known as the Goddes of Silk Worms. The other is Shen Nong, China's "1st Farmer". Early farm implements on display at XianNongTan, a primitive weed seperation device, man powered wooden and bronze plows and more (Nov. 2007). in Chinese, so those who did not master the Chinese Language miss out on further information. Capital of China. Since its construction as one of the 8 Holy Altars of the Crown it was in continues function throughout the Ming and Ching Dynasties. As for the farming implements on display, there are among things an early weed separation machine, what seem to be manpowered plows, various types of millstones and other less easily identified devices. implements. The earliest Chinese Civilizations were located on the lower flows of the Yellow River. They were fertile lands, but were often flooded by the ancient Yellow Dragon river. Over time they developed a very advanced civilization based mainly on agriculture. Although the first cities appeared already in the Xia Dynasty (2205 BC to 1766 BC), the agricultural society would last well into the 20Th Century. Apart from the displays the two Emperors are enshrined with their own portraits and descriptions of their immortal contributions. Nothing much more is to be seen. 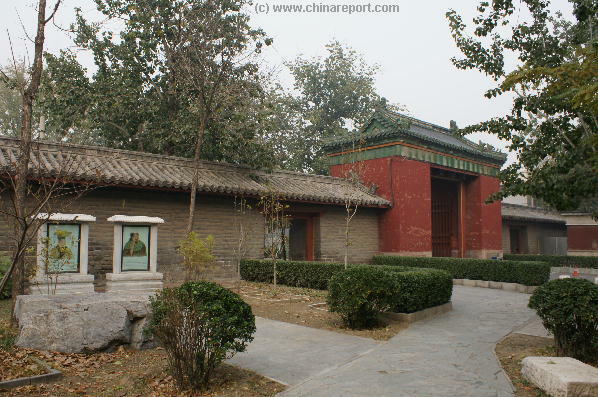 Head through the Green Tiled Gate North of XiannongTan Stadium and the small Museum to follow the central axis of the former temple northward. From the small Museum pass Northward through the large Red Gate to head up the Central Axis of the former Temple to walk toward the actual Altar location. It is quite a stiff walk past various sports fields where groups of Chinese Youths are practicing. Not many westerners dwell down here. Every now and then a group of local middle school children arrive for their proscribed school exercise.Otherwise, usually everything is calm and quiet in the Park and only gardeners and caretakers do their work. Walk along the central axis to the very end of today's Road to come into view of what is the remaining Eastern Gate of the Temple of Agriculture, the Gate which in the Past connected through to the Temple of Heaven. On the other side of it lies YongdingMen Nei Dajie' - Yongdingmen Inner Street. Nothing much however is noticeable of the busy traffic zipping by at some distance outside of the Gate. 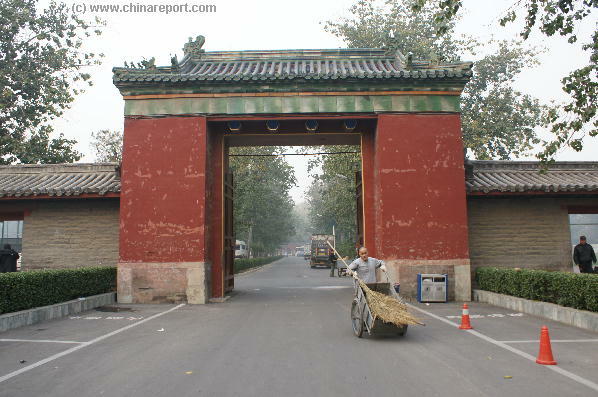 The East Gate is another one of the few reminders of the Royal Level of Architecture, -the high wall, the grand palaces and pavilions, lengthy boulevards, spacious gardens and solemn courtyards which once made up this Temple. 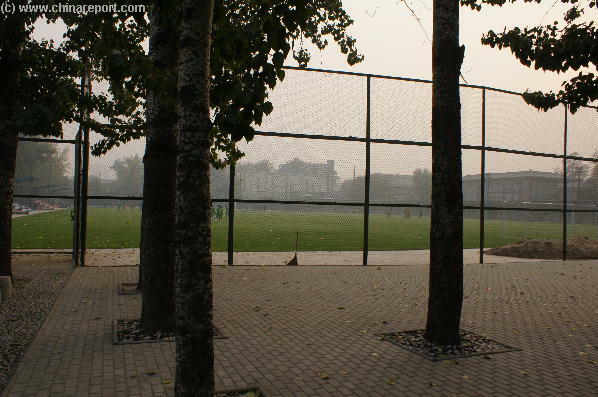 A soccer field outside Xiannongtan Stadium (November 2007 AD). in which they re-started the yearly agricultural cycle by ritually tending to a small field of crops and plowing the first furrows. Once the rituals were done, the Emperor as the holder of the Mandate of the Heavens should have ensured that nature provided another bountiful harvest. If the harvest were indeed abundant, the Rule of the Emperor was auspicious and the mandate of Heaven stabile. When however famine or disaster struck, it could be interpreted as a sign of imbalance of the Heavens. This put into doubt whether or not the Emperor had followed the wills of the Heavens correctly and in this case just about anything might happen next. Not only might other natural disasters follow, also where there is famine, there are disgruntled citizens and so a riot may flare into a much bigger thing. The Last Remnant of the Temple is the Three Doored Imperial Gate leading to the courtyard where the Field and Altar were located. Inside a basketball court has replaced the imperial holy farmland. Famine, Disaster and Earthquakes were the forebodes of chaos. They were either a punishment to the Emperor and People for wrongful deeds, or the Heavens might show to be that dissatisfied that the Emperor might fall ill and Die, losing the Mandate. Usually, the Death of an Emperor put the country into Civil War and factional strive. With a failed harvest the nation would starve to Death, hence performing the rituals was one of the central and most important functions and duties of all Emperors. The job could not have been taken more seriously. 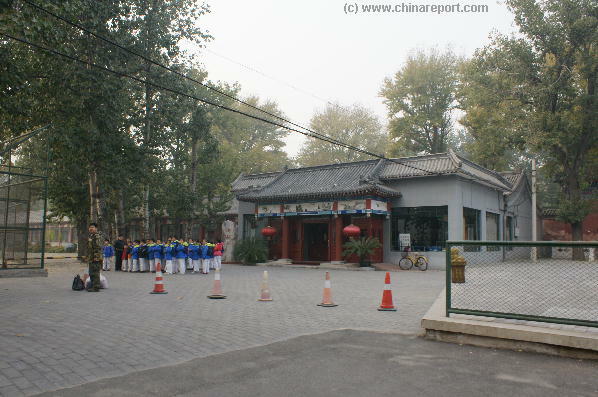 Middle School children line up for an afternoon of obligatory school exercise at the Park of the Altar and Temple of Agriculture in Beijing. 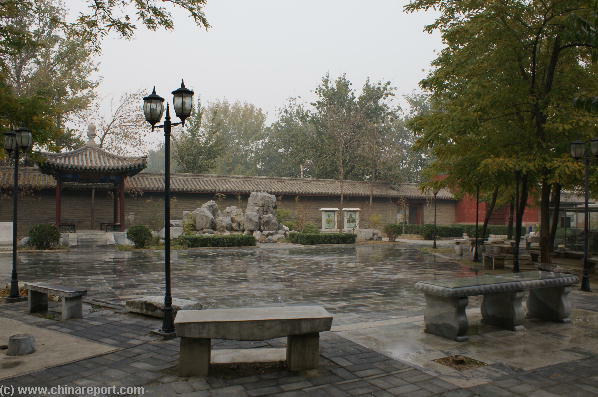 There is nothing more to be seen at XianNongTan Park. Head back the way you came to see more of the Agricultural Exhibitions or head out to the South Gate leave the Park. Somewhere just North of the location the three doored Gate stands a new Hall housing what is known as the "Ancient Architecture Museum". Ancient Stone with inscription at Altar of Agriculture Park. of the Xiannongtan Temple. The northern-most Hall, the rear Hall, is known as Taisui Dian, the Hall of Jupiter. It was constructed later than the original Altar and Temple, in the Year 1532 AD of the Ming Dynasty. The visit to the Museum is certainly worthwhile as the Hall of Jupiter with its sweeping roof is only exceeded in magnificence by the Forbidden City's Hall of Supreme Harmony. And that means something in a City with so many ancient Imperial Temples and Halls. Taisui Hall has no less than 7 Rooms (room=the space between 4 pillars) and its ceiling is uniquely decorated in black glazed pantiles and green brims according to the so-called Xieshan style. On the East and West Wings of the Hall stand another 11 rooms, 22 in Total, with an additional 7 room prayer Hall opposite Taisui Hall in the South. The Museum has a Great Exhibition of old photos of the Altar of Agriculture and its buildings Other photos give information on the other 7 altars in the Imperial City. Another even more interesting section reserved for the depiction and explanation of Ancient Chinese Architectural Methods and their development. Many models show how the complicated bracket-systems worked, and grew. Its all really fascinating. For those eager to find out more on ancient Chinese construction and methods, head down to the Museum from Tianqiao (Theatre Street) Intersection and have a blast. rather drab until recently. After the Fall of the Qing Dynasty in 1911 AD, the Emperor remained in his Palace and performing his ritual ceremonial Duties until the year 1924 AD. Even during this period the Temple had already fallen into decline. Not much after the Emperor left to become stooge King and President of independent Manchuria, the Temple Park was turned into a Park commemorating the Martyrs of the 1911 AD Xinhai revolution that toppled the Qing Rule. In 1936 AD the Football Stadium was built. 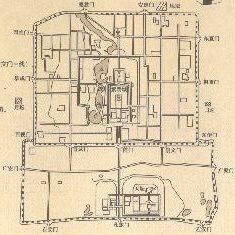 Other area's within the former Walls of the Temple Complex saw the rise of three factories, a pharmaceutical company and several middle schools (see more in: "Off the Beaten Path in Beijing") which eliminated the structures of the Imperial Kitchen, the Imperial Slaughterhouse (where ritual offerings and meals were prepared) and the Imperial Grain storage house. as fire-wood or building material in the nearby Hutong. It is unknown if the Tree survives today. The Jufudian Hall was converted into a School Library Hall. The Taishui Dian, the building that originally held the Altar of the God of Harvest and its Main Complex of Halls were in disuse throughout the 1980's but have been reconstructed since. It includes a hand-written Plaque by the hand of the Qianlong Emperor of the Qing Dynasty. Its a historically accurate copy, since the original board went missing a long time ago, never to reappear. 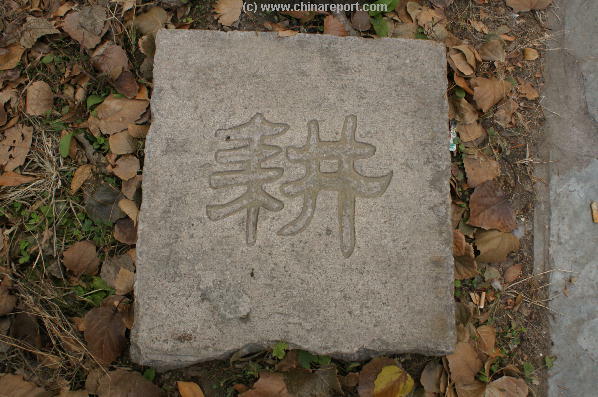 According to sources the Altar of Agriculture or for Chinese, the First Farmer's Altar has been partially restored. No trace of it is to be found when browsing around the Area though. Satellite View of XiannongTan Stadium & Area. During the 2009 Beijing International Long-distance Running Festival which was held on April 12Th the starting point of the race lay inside Tiananmen Square while its terminal point was established inside the Xiannongtan Stadium. The road to the soccer stadium also leads up to the former gate of the wall surrounding the Altar proper.